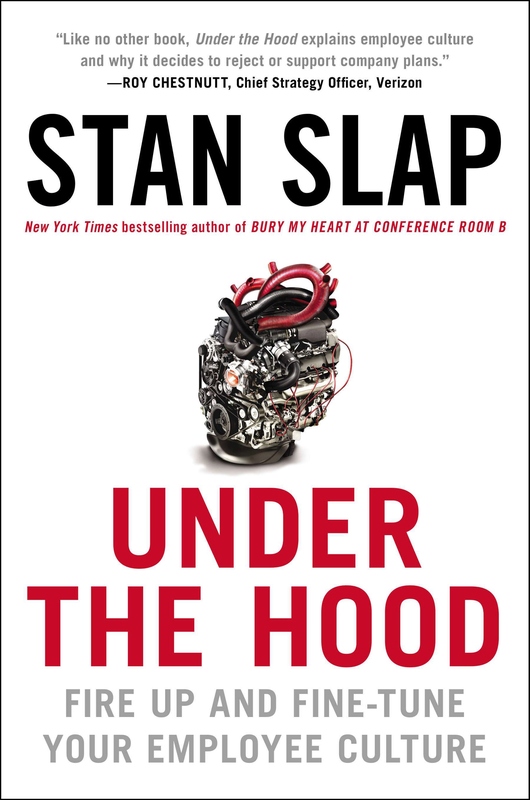 “You can’t sell it outside if you can’t sell it inside” is the philosophy behind best selling author, speaker and renowned business culture expert Stan Slap’s new book UNDER THE HOOD: Fire Up and Fine-Tune Your Employee Culture. Slap explains that in order to maximize business performance, the first place you need to look is under the hood at your own business’ employee culture. The book is relevant to any organization no matter if your culture is wonderful, troubled or even new. Slap helps firms harness the gasoline fueled power and mystery of what employee culture actually is, how it operates and how to move it forward. The Speaker Experts have acquired copies of this soon to be best selling book and are making them available to the first 20 followers of our blog who request one. The books are signed by the author with an inspirational message. You can order your complimentary copy by filling out the form below. As always, there is no charge for the book or the shipping. This is just a small way for us to say thank you for being part of our hub for meeting planners, speakers and speaker agents. Hall of Fame Speaker Out of Retirement!